Features to consider that could influence your choice are brand, size, shape, magnification, range/distance measured and accuracy, ease of use, and how you want to carry it around the course. Of course, you want your rangefinder to offer you an accurate yardage each time you measure the distance to the flag (or another object). Fortunately, these devices are highly accurate across the board. The majority of rangefinders on the market today are accurate to at least within one yard either way – and many are more accurate than that. 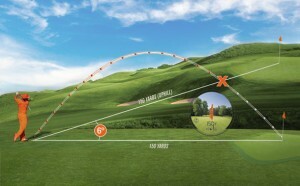 Compare this accuracy to your own game – are you able to dial up distances down to the half yard? Probably not. As long as you buy a decent unit from a respected manufacturer, you can count on your rangefinder being more accurate than your own game. One of the interesting things about golf rangefinders is the constantly increasing range that is included with various models. While it might be cool to have a rangefinder that can measure distances up to 1,000 yards, what is the point? Unless you are going to be using your rangefinder for another purpose as well – such as hunting – there is simply no need for such excessive range. For the typical golfer, a rangefinder which can measure out to 350 or 400 yards will be more than enough to get the job done. Magnification is an important point to check on as you shop, although most models available today include sufficient magnification. The benefit of having ample magnification in your rangefinder is making it easier to spot your targets in the distance. For instance, if you are trying to pick out the pin from over 200 yards away, having 5x magnification will make the task far easier than if you only had 2x or 3x. Fortunately, 5x is relatively standard at this point, and some models include even greater magnification power. Early rangefinder models could be a little challenging to use, which gave these devices a bad reputation as compared to their GPS counterparts. GPS devices are extremely easy to use, which is why many golfers opted for that style of distance measuring. However, times have changed, and rangefinders are now nearly as easy to use as GPS units. You don’t have to hold as still as you used to when using a new rangefinder, and many have ‘pinseeker’ technology to help you lock onto the target. Again on this point, it comes down to buying a quality unit. If you spend the money on a good rangefinder with modern features, you can count on it being easy to use. Like most golf gear your budget will narrow down the field of rangefinders to select from. In general, it will cost $150 to $400 to buy a decent rangefinder. The more you pay, the better the feature set you will get hopefully from a more trusted manufacturer. You will start seeing quality devices that offer pin seeking and slope around the $250 price point. Battery life is not something that should be high on your priority list when shopping for a rangefinder. While you do want the batteries to last a while, of course, performance in this category tends to be solid regardless of which model you select. Rangefinders are actually turned on and in use for a relatively short period of time during a round of golf, meaning the battery is not drained rapidly. It would not be at all surprising to get more than one season of performance out of your battery before it needs to be replaced. The durability of the rangefinder you select is likely to be tied closely to the amount of money invested in the purchase. If you spend enough money to purchase a quality product near the top of the market, you will be rewarded with a durable unit. Of course, no rangefinder is going to take kindly to being run over by the cart and then assaulted with a five iron, so treat your device with care and it will be good to you as the rounds go by. You should check to make sure that any rangefinder you purchase comes with a case. Most do, but double check just to be sure, as this is an important piece of the puzzle. Without a case, it would be difficult to keep your rangefinder in good condition over the long run. Assuming you do receive a case, use it consistently even during the middle of a round. Always put the device back in the case between shots, and clip it securely onto your bag if you are walking the course. One of the potential challenges with using a rangefinder is making sure you measure the distance to the correct object each time. Are you sure you are getting the distance to the pin, or are you accidentally measuring that tree behind the green? To take away this concern, many rangefinders are equipped with a system which will scan the field and pick out the pin automatically. Needless to say, this is a great feature. If you are a little shaky when holding a rangefinder, or if you just want the added assurance of knowing you have the right number, pick a model with some type of pin seeking technology. In addition to finding the absolute distance to the pin, rangefinders with slope will estimate the yardage you should play a shot by taking into account the change in elevation. If you are playing a courses with elevation changes you might as well spring for one that calculates slope. Be aware that rangefinders that calculate slope are typically not legal in tournament play. Often golfers find that ease of use is very important out on the course. Golf is frustrating enough before adding confusing technology to the mix. Out on the course, you do not want to be having to remember too many buttons to push just to get the range to the pin, so something that is easy to use and operates in a “point and click” manner is often the way to go. Tip: Consider the time of day you will be using your rangefinder. You will want a rangefinder that works well in low light conditions if you like your round of golf early in the morning or towards the end of the afternoon. Some of the rangefinders on the market today are extremely compact and lightweight – they fit easily in the palm of your hand, and slide neatly into a small case. However, there are also models which are quite large and rather heavy as well. Which should you choose? Most likely, you will want to make this decision based on your mode of transportation around the course. If you usually walk the course with your bag on your back, opting for a lighter model is a logical pick. Clip the case onto your bag in a convenient location, and don’t worry about adding a significant amount of weight to your load. On the other hand, if you always ride in a power cart, you aren’t going to care much about heft. In that case, feel free to pick out whichever rangefinder meets your needs, regardless of size.